World capital markets are significantly rattled by the complete failure for another Greek can kick. 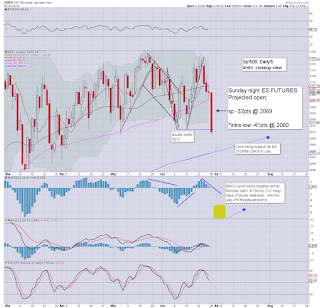 US equities have so far seen an intra low of -41pts.. equiv' to an open of sp'2060... currently -32pts @ 2069. There are far more severe declines in EU indexes, with the German DAX lower by around -5%. So.. a little bounce... not exactly surprising. For the uber bears out there... the aim has should be a break under the 200dma, which will be around 2052 at the open. Long night ahead... stay tuned! China cut rates -0.25%.. along with loosening the bank reserve requirement... however, considering the past two days of declines.. and the Greek drama.. hard to imagine the Shanghai comp' not opening sharply lower.. but that is still a few hours away. 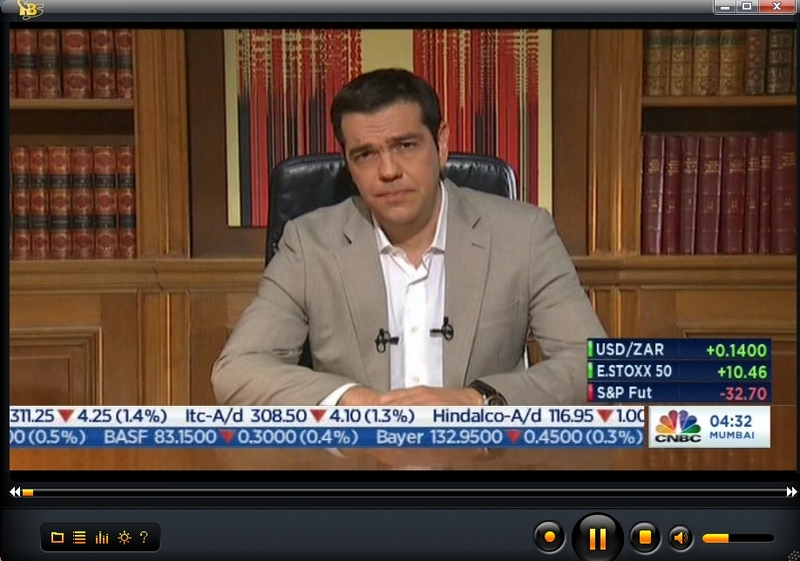 Meanwhile.. Tsipras doing the old 'look smart.. by sitting in front of books' tactic. 'deposits are safe'. Yeah.. sure they are. There can be no excuses... every Greek with a bank account had ample warning to take out their money. 7.30pm.. sp -32pts... 2069.... which is kinda interesting, but I'd sure like to see the 2050s by 11am tomorrow morning. 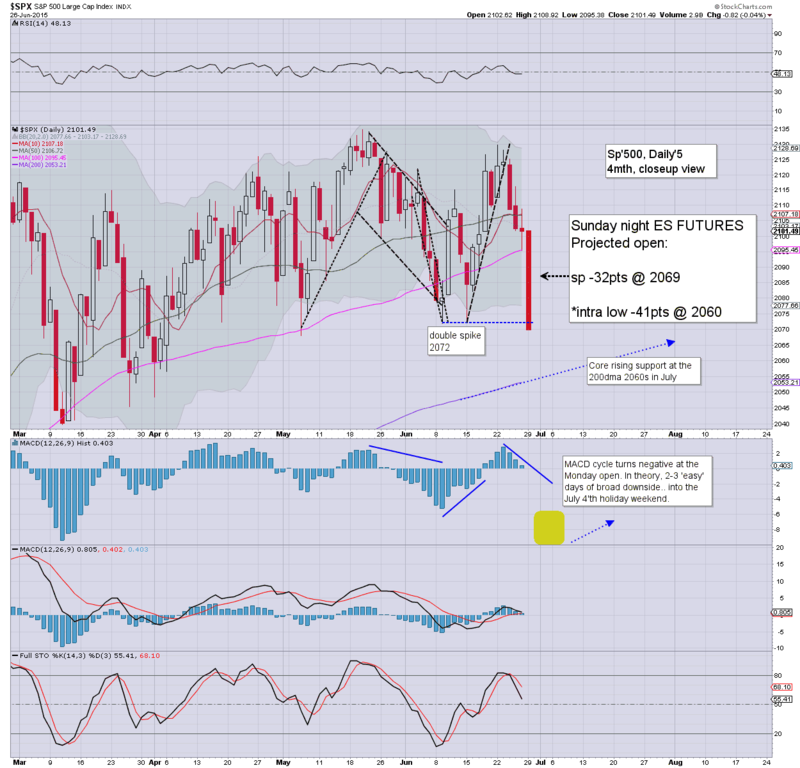 A test of the 200dma around 2053 would be a rather good morning low.. before a 10/15pt bounce into early afternoon. Good evening. 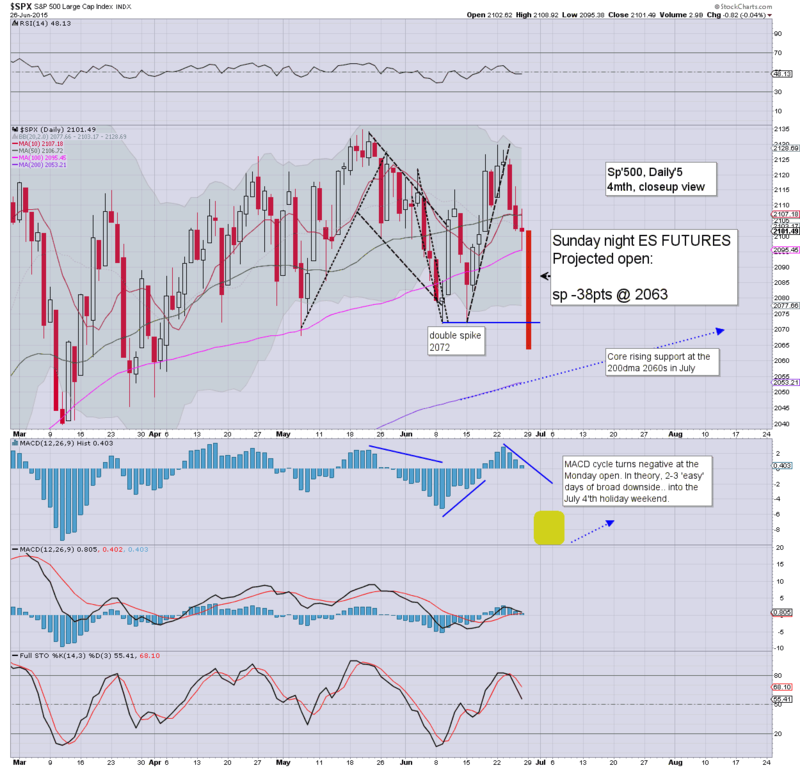 Futures have opened severely lower, sp -38pts, which would equate to an open of sp'2063. USD is on the rise, +0.8% in the DXY 96.20s. The world capital markets have a rather interesting night.. and day ahead. We have a short 4 day week ahead... and with the weekend Greek developments, I shall be posting across this evening. 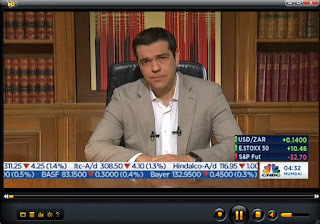 No Greek deal... with the Tuesday/end month payment to the IMF not being paid. The ECB will pull their bank liqudity program as of Tuesday midnight (unless they change their mind). *Keep an eye on China.. set to open around 9pm EST. China could accelerate lower, a -10% Monday decline would not be overly bold. As ever.. say hello.... it would be good to hear from some of you this evening. Market looks set for some serious volatility into July... and with a referendum next Sunday... the market will likely be increasingly unstable. 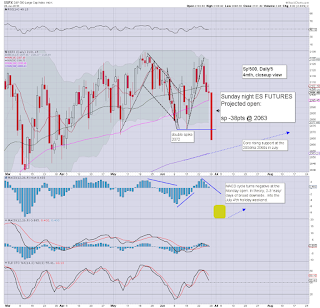 6.21pm... sp'500 holding lower by around 36/40pts.. around 2060. More notable weakness in the German DAX, futures -5.0%.. which really is pretty dynamic! 6.26pm.. Metals are catching a moderate fear bid, Gold +$8. Energy is weak, Oil -1.6%... as the stronger USD is a natural downward pressure.